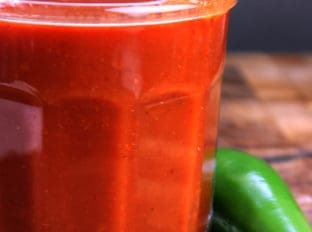 Ditch the can, this Homemade Enchilada Sauce will make you feel like you’re at your favorite Mexican restaurant in ten minutes! This Homemade Enchilada Sauce (which I am actually surprised I hadn’t posted yet) is the base recipe I use in more than half of my recipes. You haven’t seen a lot of Mexican recipes on the blog to this point and that seems to be in spite of the fact that we eat it a LOT. It is so easy to make I usually have it in my fridge and ALWAYS have it in my freezer because truth be told, I make it in 8 times the size. I scaled it down so you could make a quantity for one meal, but trust me, after you make it once you’ll be doing in it bulk too! 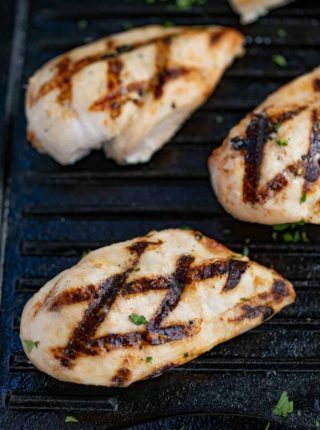 It can be hard sometimes to introduce spice into the diet of young kids, so this recipe is a perfect one not only for our toddler, but even our infant who at grilled chicken that was marinaded in this sauce overnight for dinner on Sunday. I find that probably 35-40% of our meals on a weekly basis work off of one of my “mother” sauces. No not the original mother sauces, our family’s version of them. We have a small pool of sauces that get repurposed into a dozen or so meals each. They’re so easy I keep them on hand at all times so when it is 6:00 pm and I am completely drawing a blank on dinner I can go into the deep freeze, grab a sauce and make dinner. Want another one of our favorites? Zankou Chicken Armenian Garlic Paste. We use that sauce on so much I need to write a love letter to Zankou thanking them for this recipe. When you find a good sauce that will get eaten by everyone in the house, trust me you will get creative and use it on as much as you can. Speaking of using it on everything, here are some of the ways we use this sauce! Duh, enchiladas. I mean what else would’ve been #1? Burritos “Enchilada Style” (This is a throwback to Baja Fresh’s enchilada style burritos…SO GOOD) – top the burrito with the Homemade Enchilada Sauce, some shredded cheese and bake at 375 degrees for 10 minutes. Works as a great marinade for chicken/pork too. I sort of scrape off the excess and grill on my cast iron griddle. So I was going to include photos of the process here, but as I edited them it felt so dull and not necessary. There are really no tricky parts to worry about here. 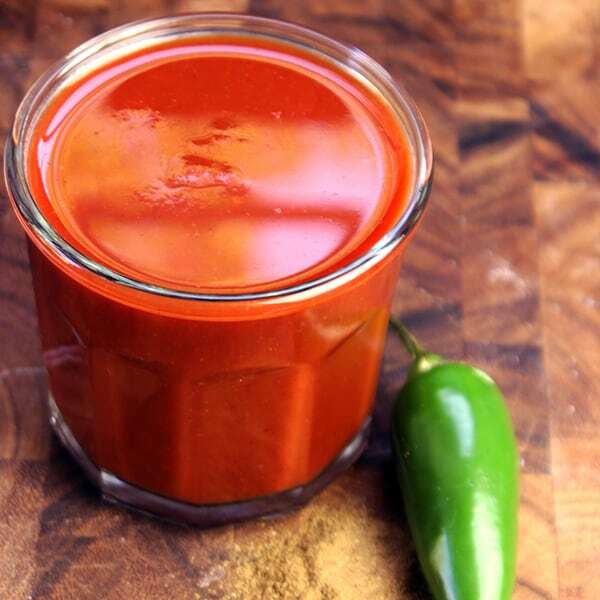 This Homemade Enchilada Sauce is amazing and easy. That being said, if you have any questions, please feel free to sound off below! I am happy to answer any questions I can! Ditch the can, feel like you're at your favorite Mexican restaurant in ten minutes! Homemade Enchilada sauce that is so good you'll top it on everything, even your eggs! Heat the canola oil in a saucepan on medium heat. Add the flour and chili powder and stir. Cook until the bright red color turns a bit brown while stirring. In a small bowl mix the tomato sauce with the rest of the ingredients until it is fully blended. Add to your saucepan and whisk until fully mixed. Cook for 8-10 minutes on medium heat until thickened. can you double this or triple it? If you have access to an Indian Marke try this with fresh ground Kashmiri Chilies (instead of the stale store bought Chili Powder), than add a dash of Cayenne or Chipotle for some heat. Kashmiris are incredibly mild, yet flavorful, and are known as one the brightest reds of any chilis grown. Made this tonight and used it in my chicken enchiladas and it was so delicious. I had never made my own enchilada sauce before and will never buy canned stuff again! Super easy and so yummy. I could eat it by the handful. Thank you for sharing and will make often. ? I used a pint jar of fresh canned whole tomatoes. I used an immersion blender to get it to a sauce. Best sauce ever. I don’t have any canola oil on hand…would it be best to sub woth vegetable oil or corn oil? You can use either as a substitute. Enjoy! Going to try this enchilada sauce. Sounds easy and yummy!? Love this recipe. Came out very good and my kids loved it too. I cook alot of mexican food and this was flavorful. 1 thing i did add was a 1/2 teaspoon of creamy peanut butter. I use it in another enchilada recipe. And instead of the onion powder i minced 1qtr onion with the fresh garlic cloves. Came out good. Can you make the enchilada sauce and freeze? I made it for seven people. Way too spicy! When I looked back at recipe thought wow 3 tablespoons of chili powder. Was this an error? Do you mean 3 teaspoons? Might still use recipe but definitely reduce chili powder. I only use two tablespoons in a whole pot of my chili recipe. 3 tablespoons is correct but feel free to adjust to your liking. Making it now, tastes so much better than anything in the store. I used Better than Bouillion Beef because I’m making enchiladas from left over carnitas (with cheese, chopped onion and cilantro). I know this sauce will make this a perfect leftover dish. Thank you. 3 TBsps of chili powder too much . I used 2 and it was too much. Thus stuff is awesome. I used two fresh romas, boiled, skinned and hit with a stick blender instead of canned sauce. Perfect! Sabrina, this is an absolutely great, simple sauce recipe. I used brown rice flour instead of wheat flour to thicken it, and it worked just fine. I also added 1/4 tsp. of ground cloves. I made a double batch of the sauce and used it to make a layered chicken enchilada casserole in a 13×9 baking dish. Great way to use up leftover chicken and vegetables! Made this tonight and it was really good!! I tripled the recipe , it was enough for two 9×13 pans of enchiladas with about a quart left over. I followed the ingredients as written, I was a little concerned it may be to spicy for my family but it wasn’t because they went back for seconds. I do find that some chili powder brands are spicier than others so maybe start with less to test the flavor and then ramp it up if you feel like the heat is okay for you. I have been using a different enchilada sauce recipe and wanted something thicker and this one is just perfect for me and so easy! Thank you!! I saw a similar recipe but with way too much cumin, which tastes like tacos more than chili. 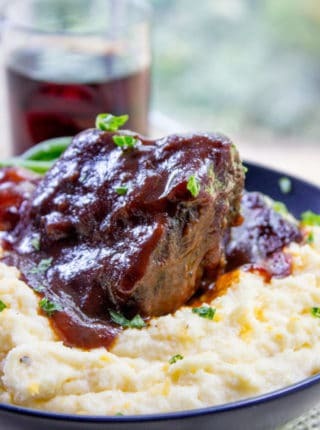 The sauce taste great but mine came out rather thick do u have any idea what I could have done wrong I cooked according to recipe with no changes. Thank you! If you followed everything, I’m not sure why it would be thicker. If you’d like to troubleshoot, send me an email at contact @ dinnerthendessert .com and we can try and figure it out. This looks and sounds DELICIOUS! Can’t wait to try it! is it ok to use cornstarch instead of flour? If so, do we need to change the measurement at all? I’ve not tested it but the general rule is use half as much cornstarch as you would flour when substituting. If you decide to try, I’d love to know how it turns out. Thanks! Try Gebhardt’s chili powder. It is not hot at all and gives a delicious chili taste. That way, you can add cayenne or other types of chili pepper powder and adjust to your heat level. Gebhardt’s is the only chili powder I use for seasoning and then I add cayenne powder to give it a little kick. I just made this after realizing that the tomato sauce in my recipe would not do the trick, needed more! Thanks for sharing, never thought of making my own Enchilada Sauce. I found this a little too hot for me, guess I can just cut back on the chili powder. I made this and it was delicious but it came out WAY darker red than what you show.. how can I fix this? This is so darn GOOD! Im tempted to eat it as soup it tastes so good hahaha. AMEN! Haha, love it! Thanks for the 5 stars, Rose. This is always my go to recipe and always tastes great. Fast and simple directions. Good idea, but IMO the proportions are wrong. 1.5 TBS of chili powder, not 3. 1 tsp of cumin, not 2. 1 tsp of onion powder, not 1/2. 1/2 tsp of salt, not 1/4. Finally, use a 14.5 oz can of chopped tomatoes, instead of an 8 oz can of tomato sauce. Thank you for a simple recipe that is going to work as a base for many yummy meals to come, tonight it’s enchiladas! I had a small can of sauce, but needed more. I had all ingredients on hand so I dove right in. So glad I did! Very good taste, too easy to prepare and the many different preparations you listed I’m sure will be sensational. Hi Sabrina, trying this now but only have vegetable and olive oil. Would I be able to substitute? And which would be better? 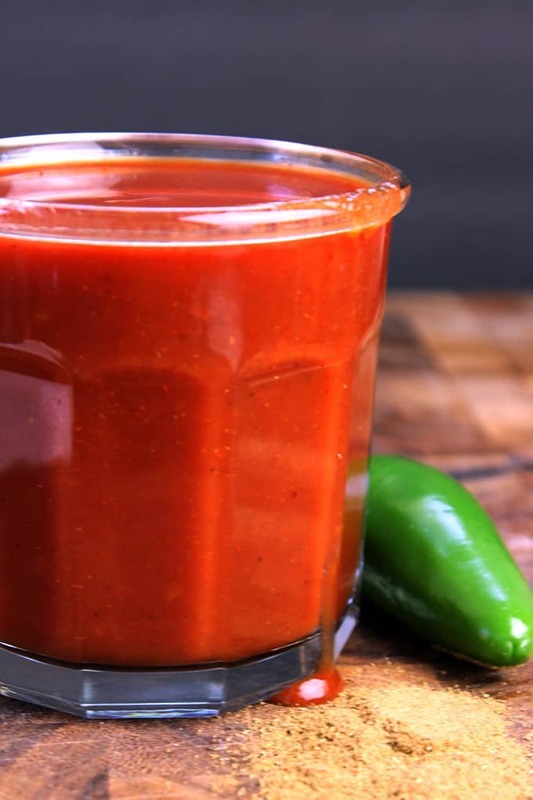 Thank you again for this wonderfully easy sauce…I am making homemade chilli from scratch and decided to start with this sauce as my basic mix…smelling amazing in my kitchen currently!!! Thanks for dropping by to let me know! Thanks for the 5 stars, Cheryl! Did I already review this recipe (I made it about a month ago)? I love this recipe! I made it the first time with tomato paste and water since I was out of sauce. It was fantastic, but I forgot to add what would have been the broth, so it made just enough for one tray. Today, I made it again with tomato sauce and veggie broth since I’m making vegetarian and vegan enchilada trays tonight. Even more outstanding! (I used ground guajillo chile powder to keep it mild for my kiddo.) I keep eating the sauce while I am making the fillings for the enchiladas. I’m so impressed you got this exactly right. Phenomenal, cheap sauce. Thank you so much, Laurel! I’m so glad you enjoy it!! 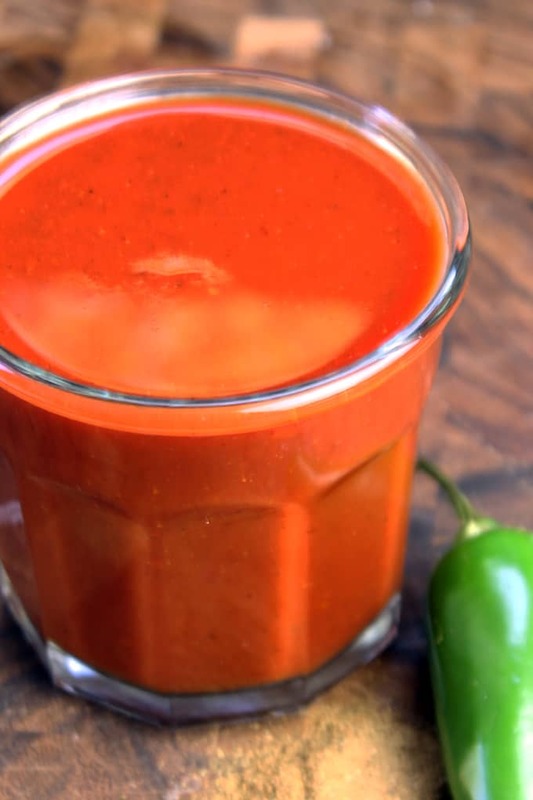 I just made this sauce…absolutely amazing and easy!!! I cook mexican food all the time but have always steered clear of enchilada sauce because I so dislike the canned version. I found your recipe and decided to give it a try…thank you so very much!!! I can’t wait for my family to try it tonight!!! I totally give it 5 stars!!! Definitely true! Thank you so much for the compliment. I made this recipe and it turned out really dark brown, not red at all. What did I do wrong?? 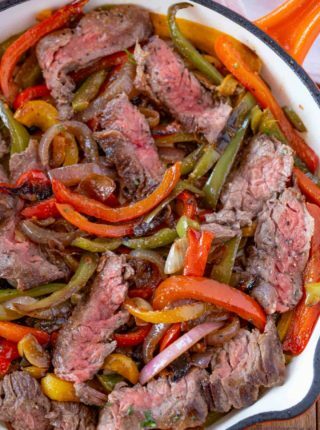 I’m thinking the color might come from the the chili pepper you used for this recipe. Is it brown or red? 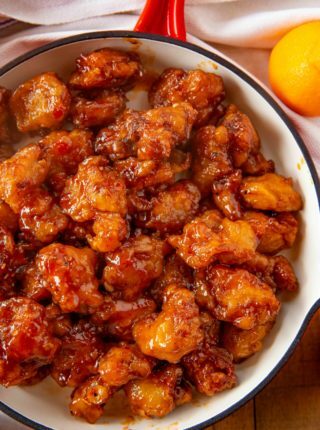 OMG, so easy and flavorful! I may never buy canned sauce again. This was easy and very good. I had to add some more broth because it was too thick. I will keep this for sure and not buy canned sauce again. I’m sold! Really good, but I found it needed 1/4 tsp of cocoa powder to really pop. is it really 3 tablespoons of chili powder? This was a very well balanced sauce, it starts savory, then the tomato, an follows with some heat. I did swap out 1 tsp. Of the regular chili powder for a tsp. of ancho chili powder to give it a smoky flavor. Thanks for the substitution suggestion! So glad you enjoyed it Jeff! When you say ‘tomato sauce’, do you mean ketchup or something like Italian passata? Pureed, seived tomato? Way too much Camino (Cumin) for that amount of Sauce. Cumin leaves a bitter aftertaste if you use to much. 1 Teaspoon Cumin for this amount of sauce is plenty. Otherwise recipe very similar to Emiril Lagasse’s Easy Enchilada sauce. I made this sauce today and it was wonderful!!! I love spice and flavor in general, so the 3 tbsp of chili powder wasn’t too much for my or my husband’s taste… I saw several posts stating that it was too spicy, but chili powder isn’t actually spicy (hot), but rather adds a deepness of flavor, I’d describe it more as smoky. It was darker than the picture, but that could be because I let the chili powder, oil, and flour cook for a few minutes longer.. Just a thought, perhaps some people might be confusing chili powder with a different hot spice containing chili peppers? Either way, Great recipe and I’ll never use a canned enchilada sauce again! Thanks for sharing! Sabrina, as I reviewed the recipe for Frito Pie i was getting hungry! then I saw enchilada sauce and was almost set to delete it when I saw the HOMEMADE sauce! I have dietary restrictions and salt is one. This is why I love your recipes…not alot of canned and processed foods. Tomorrow is Frito Pie for me! Tytyty! Awww, this just made my day! Thanks Linda! I love your recipes! Please include a few of your favorite vegetarian dishes. Houseguests are coming…Thank you! I have a whole category of vegetarian dishes for you to look through, but some of my favorites are Olive Garden’s Ziti al Forno, Thai Noodle Salad, and Parmesan Garlic Crash Hot Potatoes. I have never commented on a recipe I made from Pinterest(that I can remember) but this one is worth taking the time. After avoiding making enchiladas for a couple of years because of the yucky canned sauce from the market I decided to make my own. Pinterest offered many, many recipes. This one caught my eye because of the cute glass container pictured. Logic is my middle name. I made a double batch of this because I had faith it would be good. Score! This is a definite keeper! I did only use 4 tablespoons of chili powder for the double batch). It was spicy enough for us but I may put in a scoshe more next time. I have enough left to freeze which Is great! We had one enchilada left from last evening’s dinner and some leftover Mac and cheese from a couple of days ago. We split the enchilada and had the Mac and cheese with it for lunch today. I put some of that awesome sauce on my m&c and OMG, it was sooo good. I love a recipe that makes me want to have it A LOT!